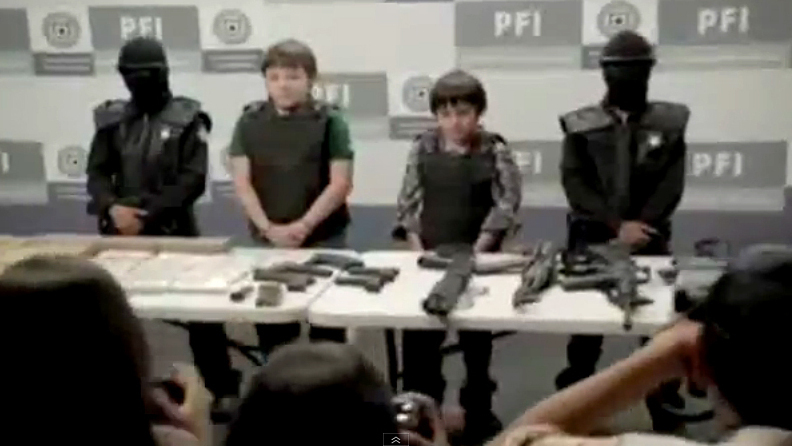 Video Of Children Portraying Adult Criminals Is Withdrawn In Mexico : The Two-Way A video that caused a sensation in Mexico for using child actors to highlight social and political challenges has been removed from both YouTube and the website of the group that produced it. Despite being online for less than a week, "Niños Incómodos" was viewed more than 1.8 million times. Children portray drug lords, corrupt police officers and human traffickers in "Niños Incómodos," which was viewed more than 1.8 million times in one week on YouTube. The short film, titled "Niños Incómodos," found a huge audience immediately after its release. Despite being online for less than one week, it was viewed more than 1.8 million times, as we reported. After the removal of the video, Our Mexico of the Future did not respond to a request for comment from NPR. The film is still available on the Noticias MVS site's YouTube channel — where it starts at the 41-second mark. MVS journalist Luis Cardenas also discusses the film and the debate it sparked. The video's title seems to be a takeoff on Al Gore's An Inconvenient Truth -- which was released as Una Verdad Incómoda in Spanish-language markets. And it seems the hyper-realistic "mockumentary" went too far for some Mexican politicians, who complained the filmmakers were irresponsible in using children to portray violence and corruption. In particular, politicians and child welfare groups said the video's producers took advantage of the children when it showed them holding guns and cigarettes, and indulging in lawless behavior. The push to remove the video came from Mexico's opposition Institutional Revolutionary Party (PRI) and other parties. PRI's presidential candidate, Enrique Peña Nieto, is considered the favorite to replace President Felipe Calderón in the July 1 election, in which voters will also elect hundreds of legislators. Writing at the site La Verdad de Tamaulipas, Luis Lauro Carrillo says that members of the Chamber of Deputies (roughly equivalent to the U.S. House of Representatives) asked Mexico's Interior Ministry to ban the video on the grounds that it violates human rights. Other sites have confirmed that version of events. The reasons for the video's removal came as a surprise to some observers of Mexican politics, who had assumed it might come under fire for possibly violating rules against political films in an election season. And the origins of the film have been questioned, as well — its backers include insurance giant Grupo Nacional Provinical. "It's funded by wealthy men," Temple history professor Arthur Schmidt tells The Philadelphia Inquirer, "but it's hard to locate its political viewpoint." One thing left out of the picture, he says, is "the United States, the chief consumer of the drugs, the chief source of the weapons." Mexican cable news channel Milenio says that when it asked Our Mexico of the Future about the video's removal, a representative said the group had no comment, and that it will now focus on the "visions" for Mexico that the video's audience sent in. When it was first posted online, the mockumentary's viewers were invited to write or record their own ideas about how to solve Mexico's problems, and send them to the group — which pledged to compile them and send them to the country's leading political parties. The video ends with a group of children gathering in front of a black backdrop, as a young girl faces the camera to address Mexico's presidential candidates — Nieto, Josefina Vazquez Mota, Andres Manuel Lopez Obrador, and Gabriel Quadri — by their first names. The girl says in Spanish, "If this is the future waiting for me, I don't want it." On its website, Our Mexico of the Future claims to have received more than 10.6 million submissions, in which Mexicans discuss how to improve life in their country.